This week and last I find myself once more in Austin for the SXSW conference, and once more I'm reminded of just how awesome Microsoft's OneNote is. Shipping as part of the core app experience on every Windows Phone, it's an app that I suspect many have ignored. Well, it's time to look at it again, because it really does show you just how well your smartphone can work in a cloud-based connected environment. 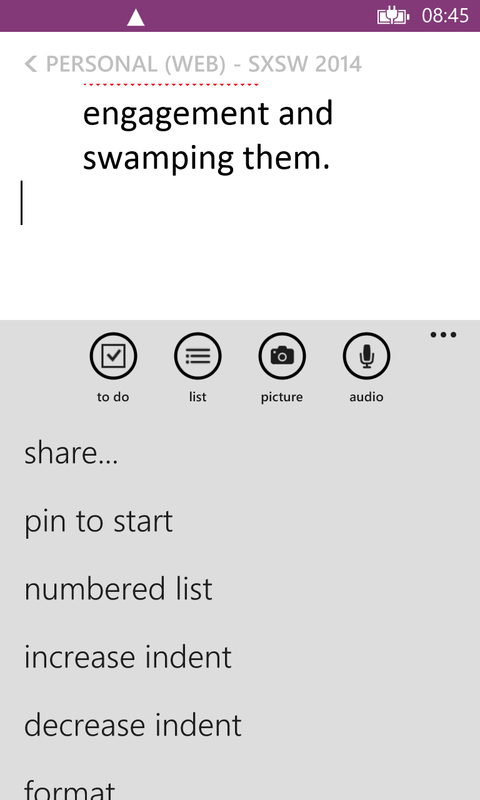 For those of you who haven't explored OneNote on your smartphone, it is a structured notebook. You can create major sections in the notebook, and each section can have as many pages as you want. These pages can carry text, audio, images, bullet point lists, and checkbox to-do lists. You also have the ability to alter font sizes, formats, and weights. You have more options than a simple text editor, but not as many as a good word-processor. It's enough to take notes and focus on layouts in note-taking form. 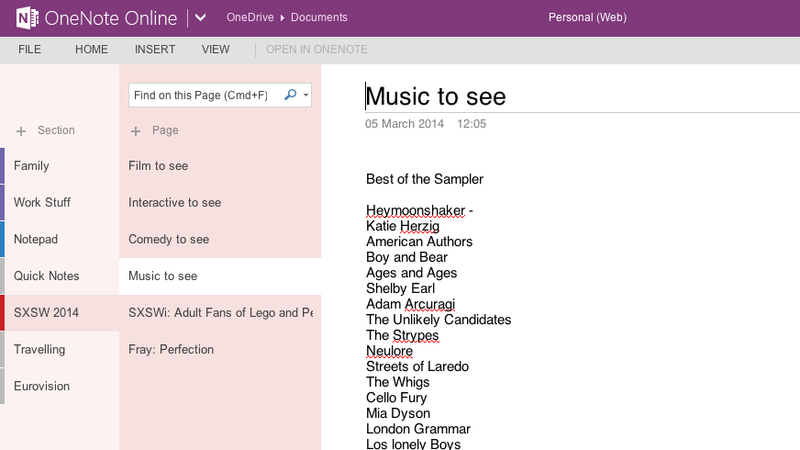 You also have to remember that there is another organisational part to OneNote - the OneNote file itself. You can easily create a OneNote file for work, one for leisure, one for each project, or one that is kept for very, very private things. This is easy to set up on Windows Phone, and through the cloud integration, even easier to manipulate on OneDrive. Ah yes, OneDrive and the cloud sync of OneNote. OneNote on Windows Phone does its best to stay synced when it has an internet connection. There's no need to remember to save your file as you go along or as you exit, because it is done automatically for you. That means you can go to your OneDrive cloud storage on any desk-bound web browser and open up your current OneNote file, confident that it has all the changes. Running OneNote on a larger screen, especially 'widescreen' on a laptop, and you can see the structure of a OneNote file with a lot of ease. It's very easy to take notes, make edits, and create new work, and as these are also synced as you go along, the data will appear on your phone in very short order. That's the system, and it's one that I've dipped into infrequently while at home, but now I'm here in Austin and working in a fast-moving conference environment, OneNote is working wonderfully. Let's start with session notes. I'm not using my smartphone for this, I'm actually using a Surface Pro 2 with the Type Cover 2. This sits in my lap, and has a native OneNote application that allows me to type in far faster than I could do on my phone (the touch screen also lets me take quick sketches as required). Once I step out of a panel, though, I know the notes are in the Surface, in the Cloud, and also on my Phone. Each session is on its own page, so they are easy to find again. The flow of information the other way is just as important - I'm not going to pull out the Surface to take a quick note of a website, film recommendation, band suggestion, or someone's contact details. That's where the phone comes in - quick, unobtrusive, and simple to use. I've a live tile that is my 'scratch pad' which I use to dump any information I get when on the move, so I capture but know I can filter later. One interesting use case was something called 'Fray', which is a storytelling event that I take part in every year. While I blocked out the story on the flight over, I've been tweaking it throughout the days on my phone. Just before going on stage, not only did I have the completed story, but I also had the headings of each section in big friendly letters that acted as an aide memoire on the phone screen while I was performing. The important thing is that OneNote is a cloud service that works. I never feel that I am working on files in a solitary device, I am working on 'my' notebooks. Pick up the phone, it's there. Pick up the laptop, it's there. Heck, pick up my iPad or the Sony Android tablet, and the OneNote client gives me 'my' notebooks. So many people (myself included) believe that Microsoft's future is going to mirror the Internet and have online services at the core of the strategy on mobile, laptops, desktops, and server solutions. OneNote has been around for many years (I remember using it on a Compaq TC1000 tablet at SXSW 2006) but it has now been refined and improved. It's far easier to use now on a single device, but it is also a cloud solution that simply works with no fuss or hassle for the end-user. If you or anyone else wonders if Microsoft can do cloud services, the answer is in OneNote, and the answer is 'yes'.